LA JOLLA–Celebrating its 15th year the weekend, the La Jolla Concours d’Elegance will return to the stunning shores of La Jolla. Earning the reputation as one of the finest internationally renowned classic automobile showcases in the United States, the La Jolla Concours continues to attract discerning car enthusiasts from around the globe. The La Jolla Concours d’Elegance will be celebrating Cadillac as the honored marque. Cadillac is the oldest surviving brand in the United States, dating back to 1901, which promises a stunning assortment of models to be showcased at the April 12, April 13, and April 14 event. In addition to Cadillac, La Jolla Concours will celebrate 100 years of Bentley and the 50th Anniversary of the Mach 1 Mustang. In total, attendees can expect to see over 130 spectacular automobiles from around the world. The celebratory automotive weekend will begin on April 12 with an exclusive private themed party. On Saturday, organizers will kick off with the annual Tour d’Elegance, followed by a VIP Reception on the Concours lawn that evening. Saving the most extravagant for last, the weekend will conclude with the La Jolla Concours d’Elegance on April 14 with over 130 world class autos, a champagne and honey tasting garden, a VIP Lounge, and Hospitality Suites. Staying true to tradition, we will also be featuring the La Jolla Motor Car Classic at the Concours, which will once again be free and open to the public and will expand the show from the Ellen Browning Scripps Park into the La Jolla Village roadways displaying a variety of automobiles. La Jolla Concours d’Elegance proceeds will go towards La Jolla Historical Society, which preserves the history of the gem known as La Jolla. 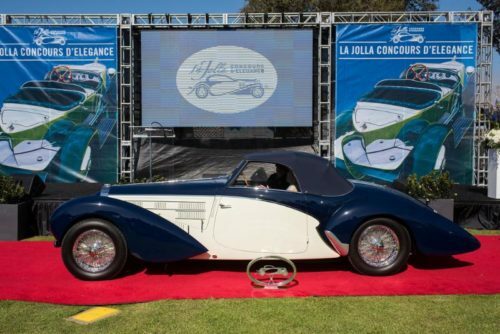 In addition to the La Jolla Historical Society, the La Jolla Concours d’Elegance benefits several additional local community nonprofit partners each year. To purchase tickets to all of these coveted weekend events, or to register your vehicle, visit www.lajollaconcours.com or call (619) 233-5008.